For more than a century, the name Perry stood for health in Ridgefield as three generations of physicians bearing that name treated countless ailing residents. The founder of the clan was Dr. David Perry. Born in 1747, he graduated from Yale in 1772, and came to Ridgefield soon after to practice medicine. He almost immediately became active in St. Stephen’s Episcopal Church, which was struggling to rebuild after the Revolution when the Episcopal church in town had suspended operations. Perry became so involved that he became a deacon in 1789 and took over leadership of the parish. A year later, he was ordained a minister. While rector here, he also served churches in North Salem and Ridgebury as their minister. For instance, he wanted the parish to purchase for him a quarter interest in a local grist mill as compensation for providing half-time service as their minister for four years. A fourth share of a major grist mill was a lot more than the 30 pounds a year the parish could pay. By 1795 the church and Perry reached the point where both sides decided to end his service as rector. Perry continued to belong to the church until 1809 when he decided to become a Baptist. He probably practiced medicine until his death in 1822. “Certainly many of the doctor’s wares brought happiness to the housewife and efficacious remedy,” wrote historian George L. Rockwell. Dr. Perry died in 1866 and was succeeded in practice by son Nehemiah Jr. while another son, Samuel, operated the mill. Dr. David Perry, the father, may have lived in a house that stood across from St. Stephen’s in front of today’s Community Center. It is certain that his son, Nehemiah Sr., was living and practicing there by 1850, and that grandson, Nehemiah Jr., was living there. However, after Nehemiah Sr. died in 1866, Nehemiah Jr. decided he could not live in a house that held so many memories of family, and he moved south on Main Street and practiced from a house just north of Rockwell Road. The property extended eastward to where Perry Lane, later named for him, has its northern terminus. When Nehemiah Perry Jr. retired in 1893, it brought to an end 121 years of medical service to Ridgefield by three generations of one family! He died in 1908. The old Perry homestead that was in front of the Community Center was acquired by Gov. 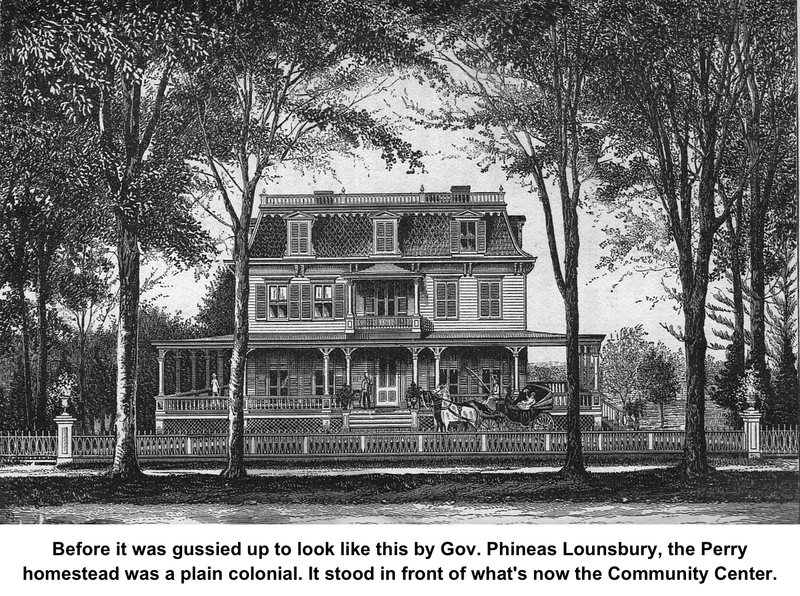 Phineas Lounsbury, who did quite a bit of gussying up, turning what had probably been a plain colonial into an ornate Empire-style Victorian. In his 1878 book, “The History of Ridgefield, Conn.,” the Rev. Daniel W. Teller observes, “Mr. P.C. 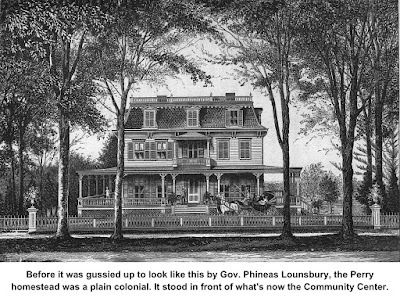 Lounsbury, having purchased the property best known as the ‘Dr. Perry Place,’ has made many marked and modern improvements about the house and grounds — improvements which are still going on and which, when completed, will make his residence second to none in the town.” Teller was so impressed with the house that an engraving of it was prominently placed near the beginning of his book. Gov. Lounsbury lived there till the 1890s when he decided to build a bigger, more majestic home — today’s Community Center or Lounsbury House — and moved his old house to Governor Street where it became a boarding house, called The House of Friends, for many years. Judge Joseph H. Donnelly (1906-1992) eventually acquired the building. The business district in the 1950s was expanding and Donnelly — who owned the adjacent land that’s now a shopping center belonging to his family — decided to convert the place to offices. Over the years, most of the “many marked and modern improvements” that made the place “second to none in the town” were lost as the building was reworked several times to accommodate the needs of commercial offices and modern building and fire codes. 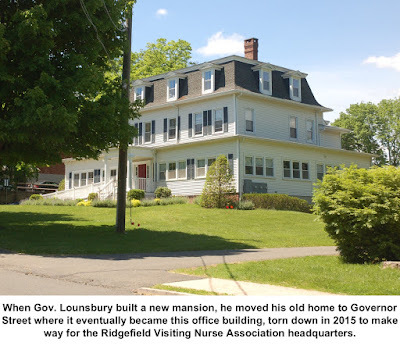 So despite its long life of housing leading people in Ridgefield’s history, little fuss was made about its being torn down in 2015 to make way for a new Ridgefield Visiting Nurse Association headquarters.